Last year we welcomed two babies into our family – Jamie is now 16 months old and Alex is 12 months. Hanno and I have already looked after both our little boys to help their parents have some free time together and I have no doubt there will be many more opportunities to look after them in the future. A lot has changed since I had my own little boys to look after. Ideas about diets have changed a lot and I’m wondering how this reflects on how babies and toddlers are fed now. 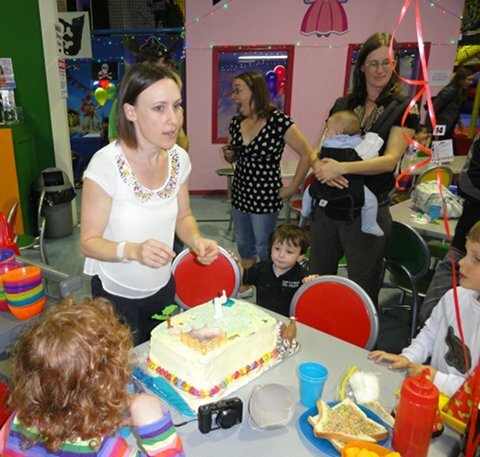 Jamie and Alex were breastfed exclusively for six months, then they had breast milk and solids. I think they’re still having a nightly feed before bedtime, although Sunny told me she wants to wean Jamie soon. Both boys have good appetites and eat a variety of foods. 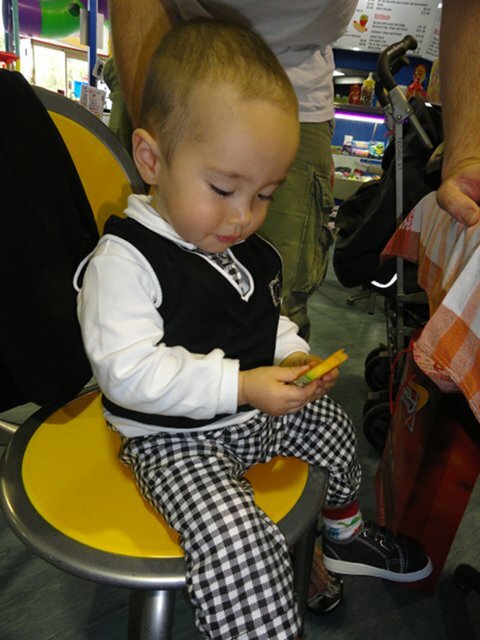 Back in the old days, babies and toddlers were commonly given salted and sweet food. I didn’t know anyone who was gluten or dairy intolerant, or who had an allergy to nuts. 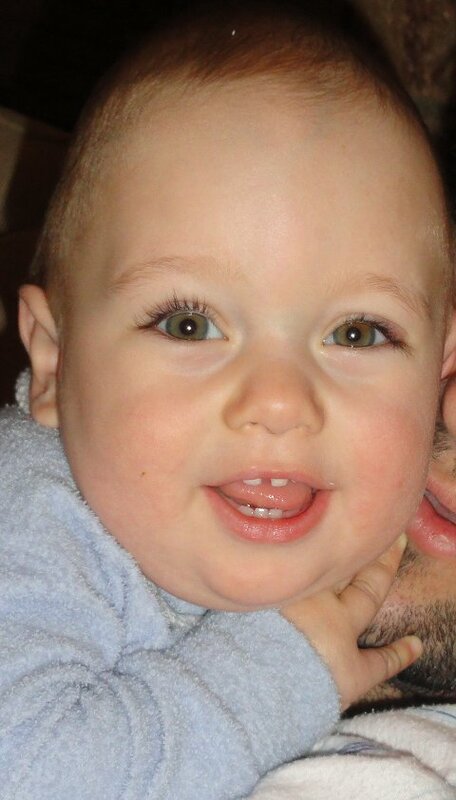 I knew of one baby who was allergic to eggs and my son Kerry didn't like eggs. He still doesn't. I think good free range eggs are excellent food for toddlers. When did you introduce eggs? 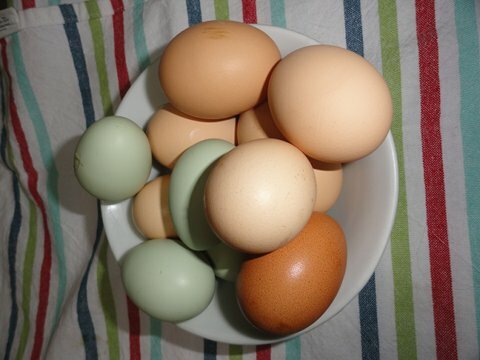 What egg recipes do your children like? When I fed my children, I wanted them to eat what we ate. 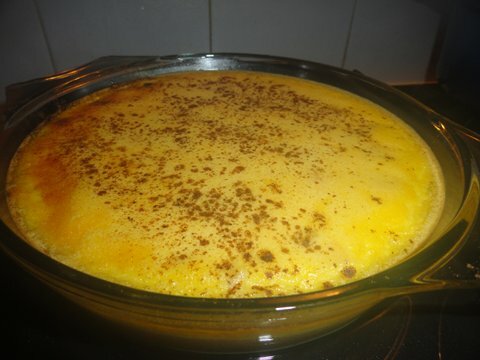 I have always cooked from scratch so it was no problem to first puree things like mixed vegetables and fruits and later on, process meals like roast chicken and vegetables, vegetable soup or lamb and rice in the blender so they were a good consistency for my babies. It wasn’t long before we had a good system going and we were all eating the same food, although in different consistencies. When my children were weaned they drank water, cow’s milk, Milo and a variety of fresh and processed fruit juices. Last Friday I spend the morning with a group of the most wonderful women. I was invited to be the guest speaker at my local Country Women's Association (CWA) annual general meeting which was held at the new Botanical Gardens in Maleny. It's very rare for me to feel like I'm one of the youngest in the group, but in my mid-60s, I think I may have been. There we sat, about thirty of us - members and visitors, in a rotunda, set into the side of a mountain looking out over the beautiful Glasshouse Mountains. Morning tea was served - scones with jam and cream and tea or coffee. Perfect. After all, this is the CWA. 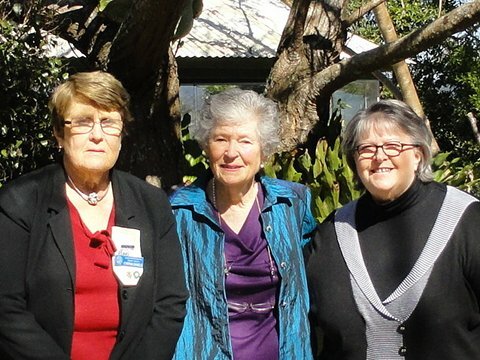 Last Friday, with the vice presidents of the Maleny CWA, Cynthia Daniels and Judy Stubbs. 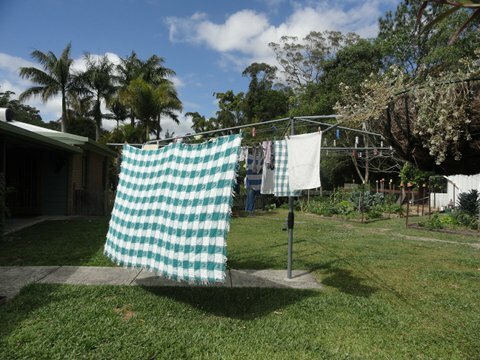 The Maleny branch of the CWA started in 1928, just a few years after the first Queensland and New South Wales branches opened in 1922. On 11 August, the Queensland CWA celebrate their 90th anniversary. The CWA is a big part of my Australia and I'm sure it means a lot to many other Australian women who read here. Whether it's tea and scones at an agricultural show, being the recipient of drought relief, which the NSW CWA administers, support for baby health clinics or rural fire brigade, if you live in rural Australia, the CWA has influenced your life in some way. How many of us have driven through country towns to see those cute cottages proudly wearing the CWA badge? Those little houses may be called Rest Rooms, the CWA House, or the CWA building but whatever it is called you know that the good works of many women have happened inside for many a long year. 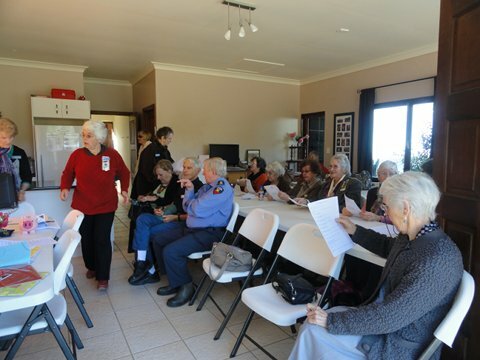 Over the years, during the wars Australian soldiers have fought in, CWA ladies from all over the nation worked to provide care parcels for the troops. That work still carries on today and the ladies in my branch at Maleny sent a much appreciated Christmas care package to an Australian solider serving in East Timor. They are also supplying birth kits for women in East Timor. During the Vietnam War the American government asked the CWA to help provide hospitality to American troops on R&R leave in Australia. As a result, over a four year period, over 280,000 American troops spent time with Australian families. And they do all this work with no fanfare, just quietly working away on cake stalls, selling raffle tickets, providing friendship, and being ready to step in when needed. Just before the meeting got underway. The two men there were from the Rural Fire Brigade. Nowadays, older people are often seen as being out of touch. Well, maybe some are but from what I could see of my local CWA ladies and those who visited from other branches, these are people of family and community. They help carry on the old Australian values of equal opportunity for all, resilience, friendship, compassion, and the rock solid propensity to stand up for family and neighbours in good times and in bad. While I was reading through the QCWA website, I found the link to this story about what Germaine Greer thinks of the CWA. Read it, it's really interesting. The way I see it is that the CWA has stood by us, working for the women and families of Australia for the past 90 years. Now it's our turn to help support them by increasing membership if we can, and by working with them, showing that we share those Australian values we all talk about. What's that saying about putting your money where you mouth is? 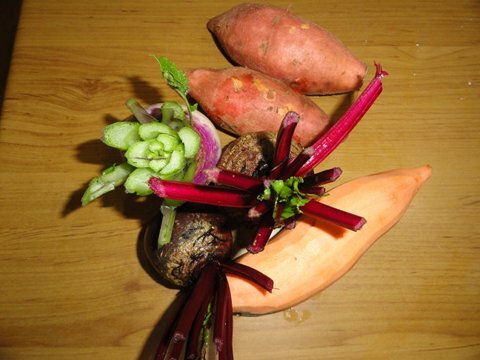 All foods that are grown have a particular season when they're naturally at their best. The seasons in the southern hemisphere are the opposite to those in the northern. The closer you live to the equator, the less the seasons play a role in what can be grown. Food grown in season will be fresher and cheaper, and it will probably have been grown in more natural conditions - not in a glasshouse or hydroponically. The problem we have today is that unless you grow your own, you don't know what is in season. We've forgotten our seasons, and in general, all thoughts of how the seasons work to produce food has been lost to many of us. This is one of the areas we need to reskill ourselves. Homemakers in the past would have commonly known this information, we should all learn it as part of our move towards being more self-reliant and aware. I think the question most often asked while Hanno and I were on our book tour was "Is this only for retired people? Surely you couldn't do what you do if you worked for a living." I'm sure all of you living a more simple life will know that organisation is a big part of making it work. With menu planning, stockpiling, routines, lists and working with the seasons, you can do most of what you want to do, even if you're working outside the home as well. Part of my yearly organisation is to make jam. We have jam on toast and scones andI use it in cooking sometimes. If I want good quality jam, made with no artificial additives, I have to make it myself. 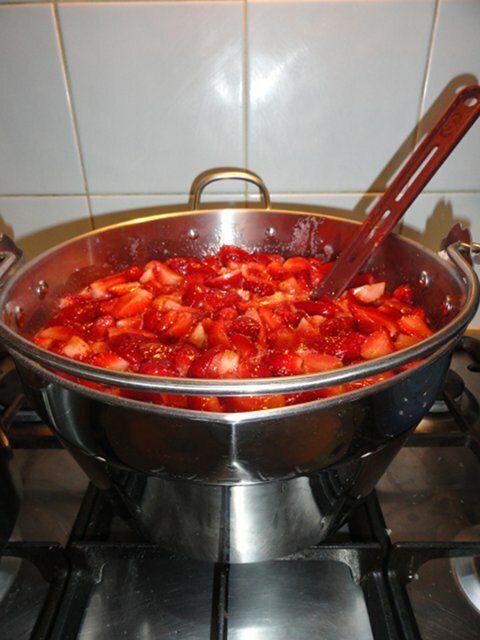 I know I can make enough jam for almost a year in half a day but because we like two jams - peach and strawberry, and both those fruits are available in abundance and cheaply in different seasons, I have to organise myself to make two separate batches, usually six months apart. Those two half day jam sessions give us good quality jam for the entire year, with enough to give as gifts as well. In Australia and New Zealand too probably, it's now strawberry season. It's time to make jam! Strawberry jam is one of the easiest jams to make and the taste is much more intense than any commercial jam you will buy. There is a recipe here. I would add pectin to it. 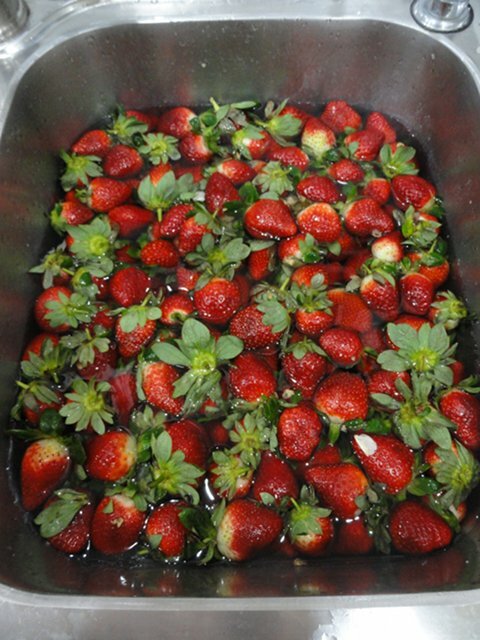 Here is an American recipe for strawberry jam. 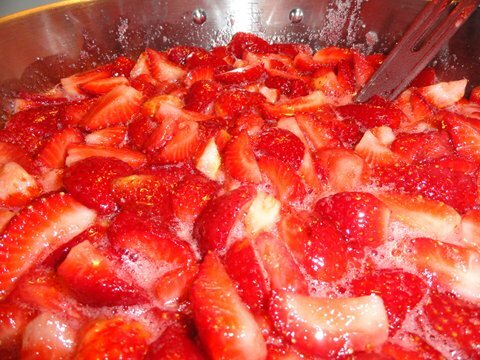 You need to understand the role of pectin in jam making too. There is a good explanation here. Pectin is the natural fibre that helps jams set and become spreadable but not too runny. 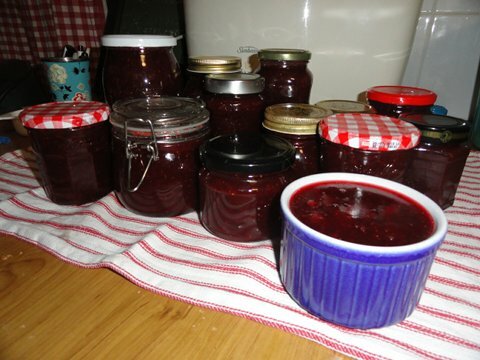 Often jams made without added pectin will be too runny to stay on your toast. You can buy pectin to add to jam, and there is no reason why you shouldn't use it. Fowlers Vacola have a pectin pouch you can buy at the supermarket in Australia. I have no doubt powdered pectin available in other countries too. Jam sugar is available too, this is sugar with pectin added to it. 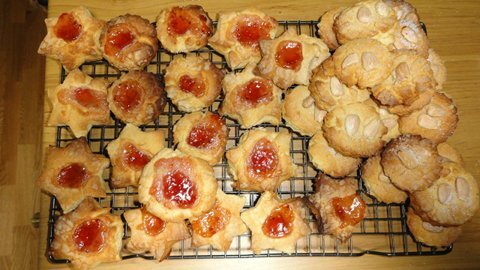 I prefer not to use jam sugar because I like to regulate the amount of pectin I use. I like jam that isn't solid but isn't runny either. When you buy pectin, check that it doesn't contain dextrose or any other additive you don't want. A guide to pectin in fruit. 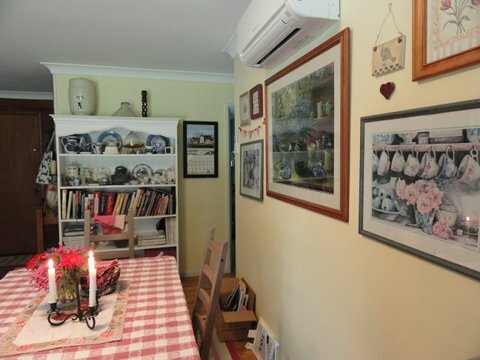 In Australia we use the English method of jam making and preserving. Those of you in the USA and probably Canada too, use a different method. Please be guided by what you think it the correct way. Here, we use recycled jars and most of us don't process our jams in a water bath. We believe that hot jam going into sterilised jars that are sealed immediately and properly, is enough to keep the jam well in the cupboard. It has been done this way for hundreds of years. Jam has a high sugar content - sugar is a preservative. If you follow the guidelines and sterilise your jars and lids properly, that delicious jam you make can be stored in the cupboard for months. If you've never made jam before, try it. 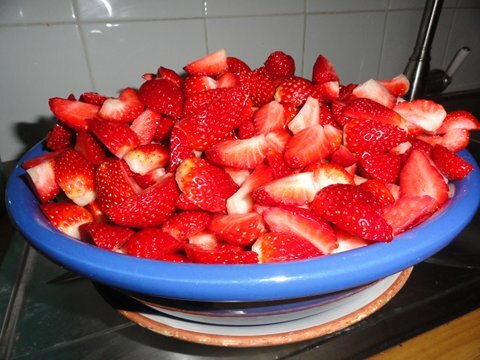 Start with a simple jam like strawberry, and I'm sure you'll be convinced by the taste alone, that it's something you should do in strawberry season every year. Congratulations to my good friends Jo and Eli who welcomed their first child into the world yesterday! Sophia Rose was born at 4.30pm. Jo is my Penguin editor and during the process of writing and editing the book, and after, when we finally met, we all became firm friends. The photo above was taken on the day we met in Melbourne, earlier this year. Jo and Eli will be wonderful parents and I look forward to meeting Sophia. I'd best get a wriggle on with the cardigan I'm writing about below. The day didn't turn out quite as I expected yesterday. 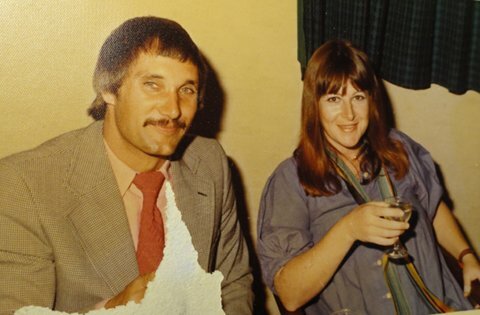 Hanno was supposed to have his eyes checked but before he went he visited his son, Jens, and discovered Cathy's car had broken down on the road to Hervey Bay while she was going to visit her parents. Hanno phoned the specialist, reorganised his eye check, and helped Jens retrieve Cathy and the car. He was away all day. My rest day took on a life of its own. I replied to a few emails, and please forgive me if you've written and I haven't written back. I do try my best and am working through the list. After that, I tidied my desk, shredded a some papers and made a few notes. Cup of tea time again, I sat outside in the sun with Hettie on the garden bench, felt the coldness of winter, made a few mental notes about plants and seeds, picked a Chinese cabbage and some herbs and went back indoors. I love being home alone, there are no expectations. I picked up my knitting, hoping to get two sleeves on a baby cardigan finished, but I went to sleep in my chair and woke about an hour later with the phone ringing. 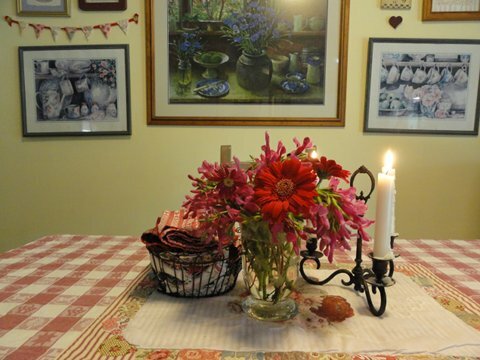 That got me moving again so I cleaned up the kitchen table, wiped it down, and put on a clean table cloth. Washed up, then outside into the front garden to check out what's happening there. I picked a bunch of fragrant, pink Salvia and some gerberas and came in again. After lunch I sat down to watch about half of Downton Abby that I recorded, and knitted as I watched (poor Mr Bates! 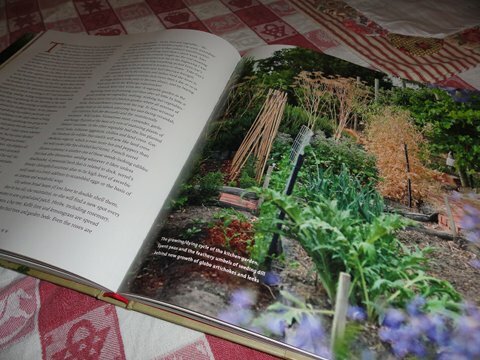 ), then read more of Kate Herd's wonderful book Kitchen Gardens of Australia - specifically the part about Gay Bilson's garden in the Adelaide Hills. I wrote about Gay here In Praise of the Domestic. Hanno made pea and ham soup on Monday night so it was wonderful knowing it was in the fridge and nothing had to be prepared for dinner. Rain on the roof, candles lit on the table, soup bubbling away on the stove with its aroma reminding me how much Hanno and I share. I wandered in and out, made more tea and sat in the sun when it came out again. The cardigan sleeves aren't quite finished but I feel I've made progress and had exactly the day I needed to have. The quietness here suits me. What is your ideal rest day? I have, on purpose, not written much about growing older in the past. I thought that maybe others aren't as interested in the process of ageing but I've been thinking a lot about it lately and if ordinary people don't write about how it feels to grow older then how will other ordinary younger people know that it is something to cherish and to look forward to? Seeing our 1976 photo on the blog yesterday jolted me into some sort of common sense. That was who we were then, we are different now. Both are good. I am in my mid-60s and even though I've slowed down a lot I really only know my age when I see myself in the mirror, or when I look at Hanno. I am proud of my age, I'll tell anyone who asks, and I've never really understood the reluctance of some to tell their age. This is part of me. I own everything I am - including my age. I am not just a number. I clearly remember teasing my mother and father about being old and forgetting things. I am at that stage now and if I don't write down what I need to know, I often forget it. I used to have an excellent memory so this forgetting thing is one of my ageing regrets. I also get tired quickly now. I still have the energy to do what I want to do, but now I have to put aside time to recover too. I've just had a busy two week period where I worked every day doing various things. Today will be my rest day. 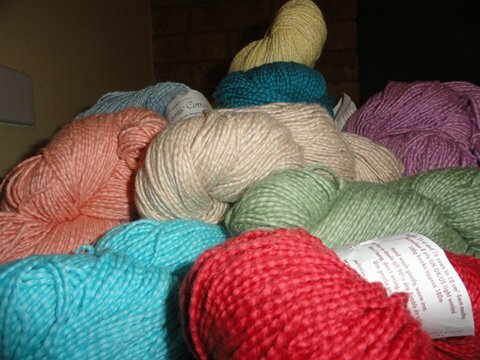 I'll do a quick clean up and then I'll sit down with my knitting for most of the day. Hanno will be out having his eyes checked so it will be a quiet day here and I'll take advantage of that. My health has always been good and remains so. My blood pressure and cholesterol are good, I don't take any medication and most days I feel fine. I think that for me, sleep helps to keep me healthy. Whenever I don't sleep well, I get a cold or a cold sore, or I can't concentrate enough to do my work. As long as I get enough sleep, I'm ready for anything. But there are so many other things that I have to be thankful for now that have come with the increasing years. I feel I'm finally understanding how I fit into the pattern of my life and all the lives I'm connected to. I feel more confident now to do whatever I want to do and if it doesn't suit everyone, that doesn't bother me. I feel much more generous now than I ever did before and I'm much more inclined to give rather than take. There is no expectation of perfection, in fact I cherish the imperfections - they seem more human to me. I am more forgiving - I can see the reasons why some things happen; but I'm also more unforgiving. I'm not prepared to accept underachievement, meanness or intolerance and will challenge it when I see it. I see beauty more clearly than ever before, and more often. Silly things make me laugh now and tenderness makes me smile. I've finally reached the point when I feel okay about doing whatever I feel like doing. There is this new freedom to be discovered in older life. People's expectations of you drop considerably. We're not expected to keep up with everyone else so we live at a slower pace and I can tell you that life in the slow lane suits me just fine. But the thing that I love most of all is that freedom to use my hours exactly how I want to. I've put the days of frantic work behind me, my needs are meagre now, my ambitions have changed and no longer have dollar signs attached to them. My ambitions now are to live well, to be part of a fine family, to lead my family by actions rather than words, to do no harm and to enjoy every day. I have friends who really hate being older but I've accepted it and I think I enjoy life more now. Let's face it, it's much better than the alternative. If you are lucky enough to age, you're a survivor because the only alternative to ageing is death. And even that makes sense to me now. What a weekend we had here! We went to Farm Fantastic on Saturday. It's a huge farming expo, the largest outdoor expo in Australia. 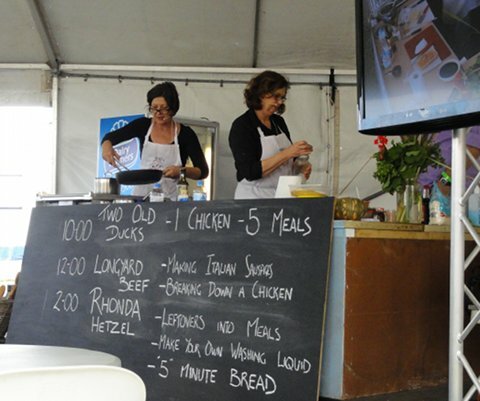 We were in the Food for Thought tent where I talked about simple life, did demonstrations on how to make laundry detergent and five minute bread and we made two 'from scratch' meals from leftover lamb. Hanno set himself up at the front of the tent, sold books, chatted to the passers-by and kept himself warm with hot coffee. It wasn't a big crowd but those who came along looked interested. A few knew me, most didn't, still, there seemed to be a genuine interest in our life way of living and the demonstrations. Annette Long organised the tent and what a great job she did. Annette has a radio program, every Tuesday morning at 10am, on 101.5FM community radio in the Moreton Bay region. If you're a local, tune in. I'm sure you won't be disappointed. Two Old Ducks - Annette and Jenn - showed how easy it is to make five meals from one whole chicken. 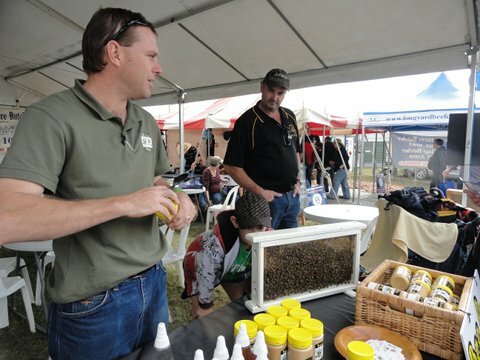 Craig from Be Raw Honey brought along honey to sell and a see-into hive so everyone could watch the the bees. The honey is delicious so I bought two jars to bring home. There was also a wonderful demonstration of how to make Italian sausages and breaking down a chicken by Josh from the Longyard Beef Company. I loved this demonstration because it showed the wise economy of buying a whole chicken and cutting it into portions yourself. Josh showed how to make small chicken roasts, chicken Kiev, how to bone a thigh and leg and how to "lollypop" the wings. He made it look easy, it IS easy and it showed me that people are out there sharing their knowledge. This is how active and healthy communities operate. In the same tent were the Caboolture Cake Decorators with several examples of their fine work. 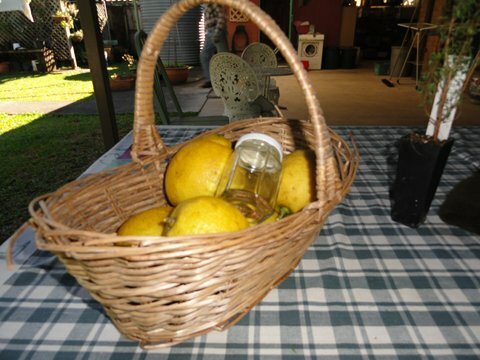 The day before the local CWA did a cooking demonstration. 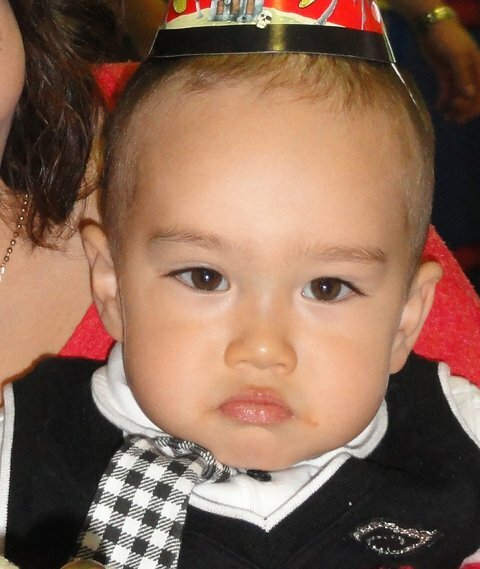 The next day there was a big Hetzel family celebration for the first birthday of Shane and Sarndra's son, Alex. We all came from far and wide to celebrate this milestone and to reconnect with family and friends. Sarndra was worried the party might be rained out because we've had so much rain recently, so she booked us all into a little children's playground venue, complete with pirate house and princess castle. 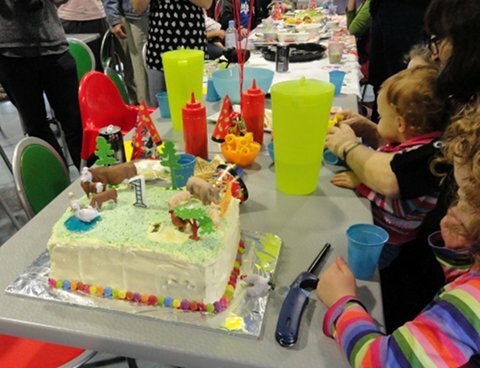 Sarndra made a delicious cake, from scratch, with farmyard animals on the top, the rest of the party fare was supplied by the venue. 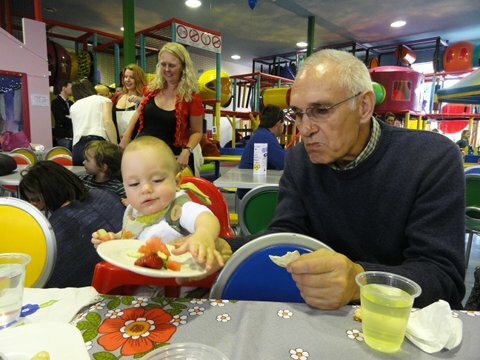 Sandwiches, fruit, lollies and drinks for the little people and hot finger food and salad for the oldies. The food and drinks were served by princesses, fairies and pirates. There were balloons and streamers everywhere. It was a great place. 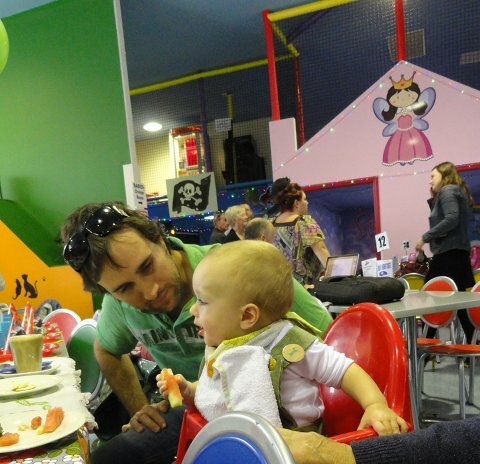 The main thing I liked about this place was that it was zoned for toddlers and older children, and there was no way any littlies could escape. 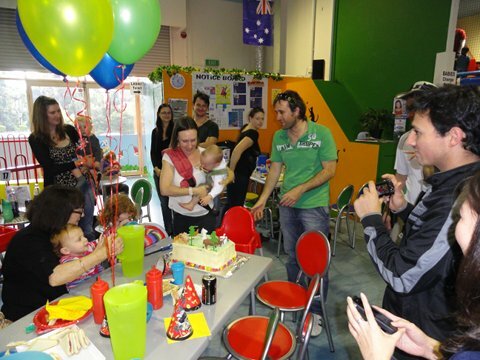 Mums and dads relaxed and could easily see their children while they played with the others so the party was enjoyed by all of us, not just the kids. And there was no washing up. 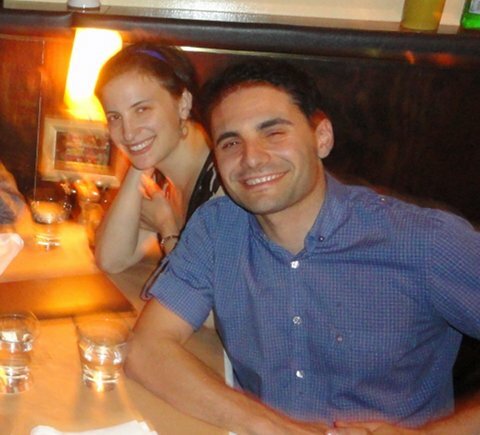 Here are Sarndra and Shane with Alex about to light the one year candle. The kids came from everywhere when they knew the cake was about to be cut. Here is the little farm yard on top of the cake. 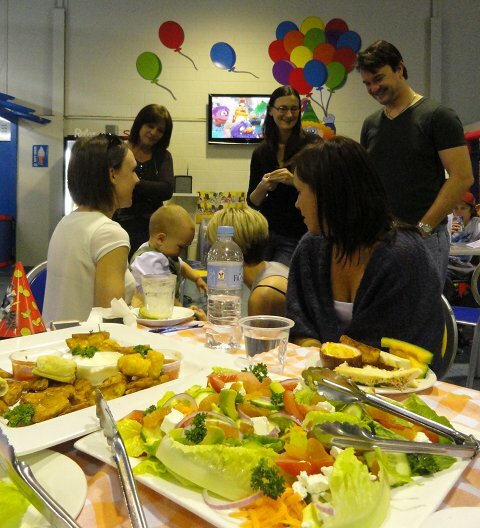 Of course, Opa was there to help Alex with the fruit, and to eat some crackers. 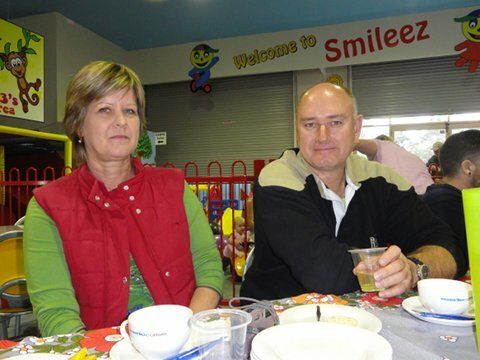 Aunty Cathy and Uncle Jens. Shane with Alex, making sure he had enough to eat. 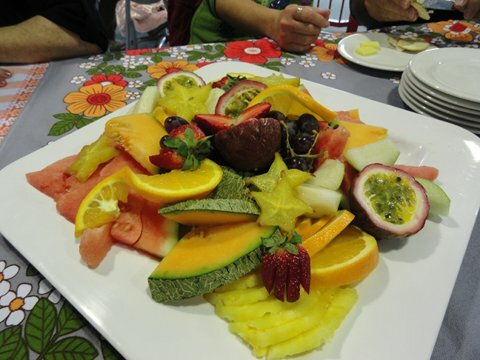 One of the fruit platters provided. 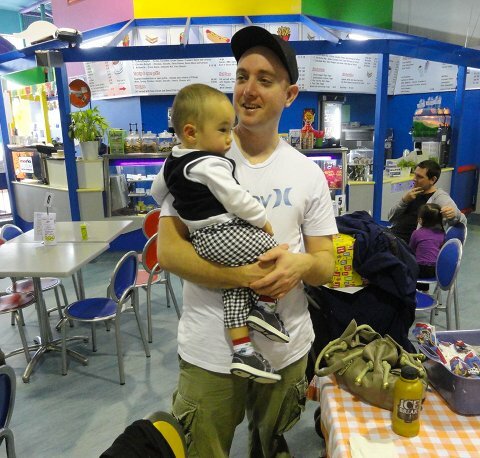 My son Kerry with his son Jamie. Sunny and Jamie. When Kerry was a very little boy, he used to walk around with a little Donald Duck figure in his hand. I've noticed Jamie often has something in his hand that he likes to walk around with too. Days like this one are such an important part of family life. They give us an opportunity to celebrate important family milestones, they help us show we love each other enough to put that day aside for the family, they give us wonderful days that will help balance out the bad days and they help us form memories that we look back on later. Strong families don't just happen, they need work, time, the expression of love and a commitment to being part of a tight unit. Days like this, and the memories of it, are the glue that help us stick together. I am pleased that learning is a lifelong process. It brings interest to our lives, it enables us to improve and change what we do and how we live. A system that offers to sell you everything you could possible need doesn't exactly support the idea of learning, nevertheless, if you step back from a purely materialistic approach to living, learning is what you'll be doing. None of us is born knowing everything we need to know. Being prepared to skill ourselves to do what we need to do in our chosen way of life is an attitude that is developed as we mature. It's better than it used to be, but even ten years ago, it was much more difficult to find creditable information about many of the "from scratch" tasks we all commonly carry out in our daily lives. It was accepted then that housework was done by women who "stayed at home" using appliances that made it all just as easy as could be. Then and now, there were chemicals to spray and wipe, poisons to rid homes of insects and mice, super phosphates to fertilise vegetables and many many shops where you could buy anything from a bottle of water to anything your heart desired. (I wonder what our great grandparents would say to us about buying water to drink.) Times have changed; there is an alternative now. Now there is a more realistic understanding that we all do some form of house work, that home is our haven, that it's a much safer and sustainable option to reduce the number of chemical products we use in the home, we understand the concepts of seasonal and local produce, developing community, solar and wind power, self reliance, recycling and the wise economy of restraint. We are still tough on women who "stay at home" but I'm hopeful that too will change. Soon. All of these concepts require something of us. They require that we think about what we hope to do in our lives and then learn what we need to deliver those hopes and dreams. If anyone should ask me what is the major difference in my life now compared to before, I'd have to say mindful learning. First there is learning how to do all the small step tasks that we now take for granted, then we learn how they all fit together. Hopefully the fitting together closes some systems so they sustain themselves, require no new inputs, yet still deliver year after year. When we have all that in play, we improve what we do and how we do it - we become experts in our own homes. And that requires more learning so we keep improving. If you're lucky, you'll never lose the will to learn and it will be a lifelong activity. Remember though that learning is not done in isolation. Often when you learn, you teach at the same time. Being a role model for your children, encouraging them to spend time with you while you cook, sew, knit, mend, plant, harvest, construct, clean, create and nurture will show them how to do it too. It may not give them the ins and outs of each tasks, but it will give them the attitude to learn. And that, my friends, is one of the greatest gifts. The search for off the grid Americans. Always interesting: Notes from the Frugal Trenches. Mary sent in this link - Cresting the Hill of Sustainable Ag - through the week - it's interesting, well written and, to me, reaffirming. Here is Mary's own blog, and even though it only has one post, and that one post was written in 2005, the story there might make you smile. It did that for me. 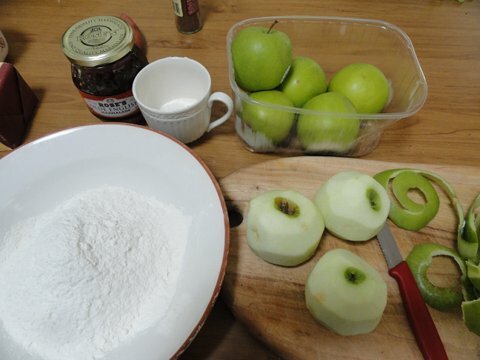 And finally, over at Bowerbird Blue, Kirsty is making little apple cakes with her daughter. I hope you can relax and enjoy life on the weekend. Thanks for your comments during the week. We all love reading them. See you on Monday! Thank you for your good wishes yesterday. I'm fine today, I just needed a relaxed day to recharge. I am learning a lot about myself lately and I do know when I need to step back and sit down. Since the book was published, I have become very busy and in the past month, have gone back as manager of the neighbourhood centre. It's really a full time job that I try to do in about three days. I've also been doing a fair bit of writing, a lot of speaking engagements and have tried to keep on top of my house work while staying in touch with the family and enjoying my new role as granny. I'm not complaining, in fact I think the work load keeps me on my toes. I have always been the kind of person who gets more done, the more I have to do. I like feeling the pressure of work, I like being pushed to my limits, I like going to bed at night knowing I've done my fair share. I like feeling that I'm really alive. 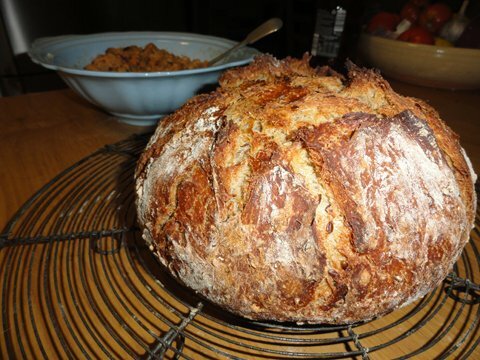 Our daily bread with the remains of the previous day's bread cut up in a bowl, soaked in leftover gravy, and ready to feed to the chooks. But now that I'm getting a bit older, I also need more down time and for that reason, and so I can spend more time with Hanno and my family, I'm consciously cutting back on a few things. I'm letting go of the Women's Weekly column - last column will be in September, I've closed down the Simple, Green, Frugal Co-op blog, I've closed down my Facebook and Twitter accounts and stopped doing a few other smaller things. I'm staying at the neighbourhood centre for the next couple of months to help recruit and train a manager but I'll leave as a volunteer worker and resign from the committee at their annual general meeting in October. That place has been such a big part of my life in the past six years. I think I am a better person than I used to be because of my involvement there and I will surely miss it. But it's time to move on. 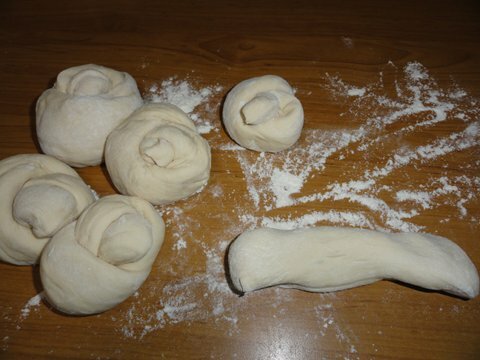 Knot rolls almost ready for baking. A few of the things I'm leaving behind have been very close to my heart but I'm much better off without the flimflammery of Facebook and Twitter. I think they're ugly spaces on the net and I've often felt a bit disappointed and disgusted when reading the stream that flies past. I created both the Facebook and Twitter accounts to link to my blog and announce new posts. I rarely wrote there, preferring instead to put the full measure of my words in my blog instead of cutting them back in FB and Twitter. Until I read Facebook, I thought that, generally, we were kinder people. I thought most people thought in a similar way to me. I honestly don't know how we got to this point. That drivel wastes so much time and a lot of it has an underlying tone of disrespect and self interest; I'm really pleased I won't see it again. I am not inspired by seeing out of context quotes superimposed onto the image of a kitten or the setting sun, and seeing animals suffering or in chains makes me so sad I can barely think. I am inspired and heartened by walking outside, breathing fresh air and working, or by talking to the people in my community. So that is what I'll continue to do. So, what will be happening here? Of course my blog will continue. I love connecting with you and when I do have to take it slower because of the odd tired day, I miss you. I'm keeping the Down to Earth forum going because there is a wonderful community of people there now and it is a great partner to the blog. My business partner Ernie and I will start our workshops soon - I'll let you know when - and we're also starting up a blog to support the workshops and an online magazine about sustainable homes and communities. One of the good things about the four of us working together - Ernie and Jenni, Hanno and I - is that we'll all take it slow and easy. We aren't out to conquer the world. We want to enjoy what we do, we want to slow down and really see and experienced all that will unfold for us. But I'm interested in knowing if you've had to do this kind of reassessment and change. If you have, what did you do and how successful was it? 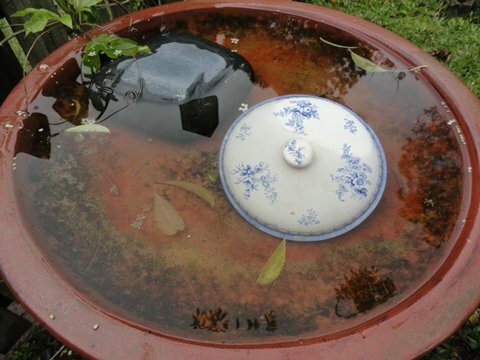 I'm too tired to do a long post today but I'd like to show you this idea I have used in the bird bath in our backyard. For some reason I have a very old blue and white china lid that must have been the top on an old lidded bowl set. It was one of the old things that has been sitting around here for years with no purpose. 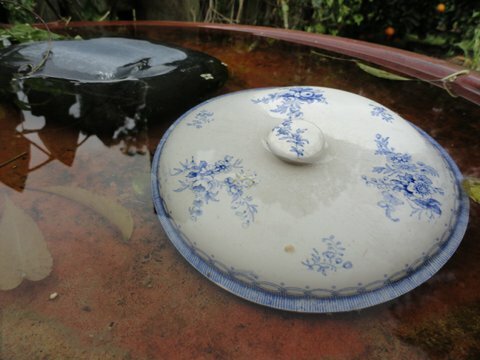 I decided to put it into the birdbath to act as a little island for insects to sit on while they drink. Insects and birds need water and we love to have a fresh bowl for them under our elder tree. However, some tiny birds and all the insects, especially the wasps, need a little landing and sitting area. This is perfect for them. They land on something stable and safe, have their drink and off they go. 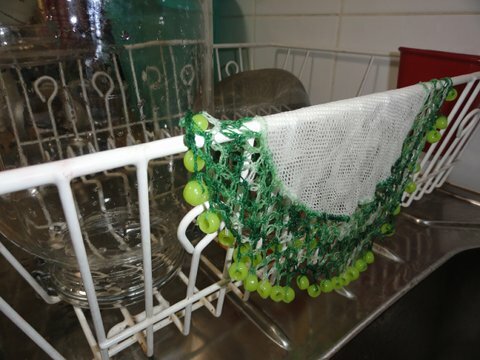 What is your unusual recycling idea? Sour cream and yoghurt are just some of the products you can make at home that taste so much better than the commercial brands. They're also cheaper. You don't need any special equipment to make these things, just some good milk or cream to start with and then add a couple of table spoons of a fresh commercial sour cream or yoghurt containing live cultures. 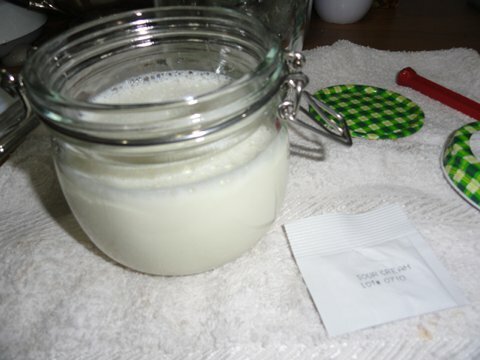 There is an old post here about how to make yoghurt. One of the benefits of making these dairy products at home is that you can make them exactly to your taste. If you want a tart taste just let them sit out of the fridge longer to develop the taste. You can also make yoghurt into ice blocks or simple cheese, or use it in your daily cooking. I love using yoghurt or sour cream in cakes. 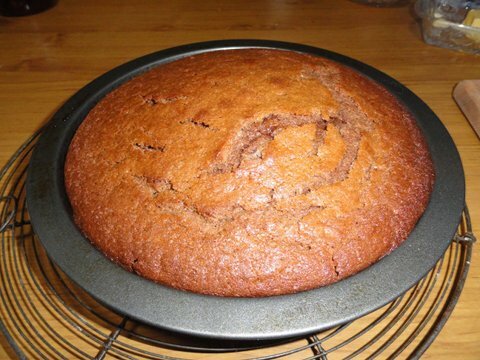 It gives you a beautifully tender cake batter and the cake is lovely and moist. One of these cakes will last, moist and delicious, in the fridge for four or five days; if it lasts that long. 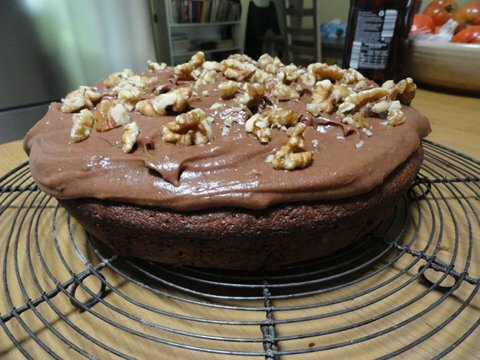 This recipe is for a chocolate cake but the basic recipe could quite easily be modified to produce a coffee, lemon, orange or vanilla cake. 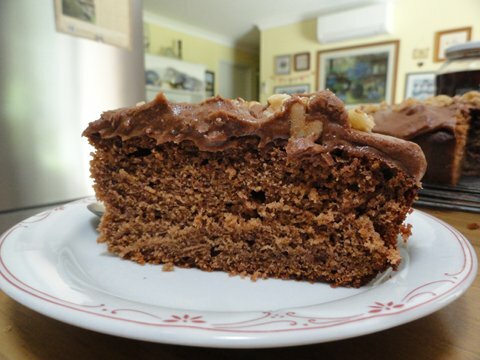 The good thing about this cake is that it's made using natural ingredients and probiotics but if you put it down before most people, all they'll see and taste is chocolate cake. Add the eggs, one at a time. When this is nice and fluffy, add the sifted flour and cocoa and fold in. Add the yoghurt and fold in. 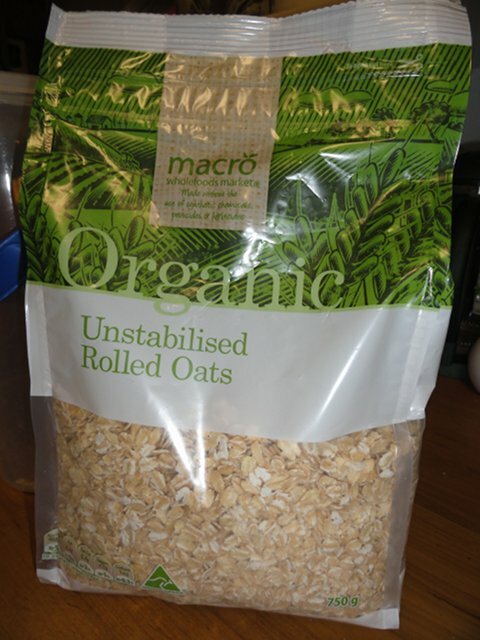 The batter should be fairly thick, but this will depend on the type of yoghurt you add. If it's too thick, add a little water. Bake in a greased and lined 20cm/9" round cake tin on 180C/350F for about 30 minutes or until a toothpick inserted in the middle comes out clean. Hanno and I will be out and about in the next few weeks. Next week we'll be at the Farm Fantastic expo at Caboolture. We'll be in the Food for Thought marquee from 2pm. I'll be cooking with leftovers, demonstrating how to make laundry liquid and talking about sustainability. On Friday 27 July, I'm guest speaker at Maleny's CWA AGM. I'm really looking forward to meeting the ladies again. The following day I'll be speaking at the Non-Fiction Literary Festival at Noosa. On 18 August, we'll be out at Bell again! This time it's a workshop on making buttermilk and yoghurt scones, five minute bread and cold process soap. We're both looking forward to Bell, the women there were really lovely and I like the way they're helping build their community. 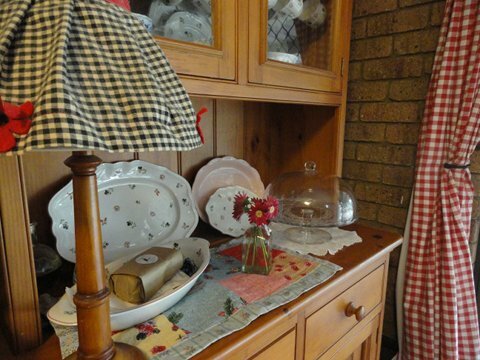 The workshop is $50 for the day, which includes your freshly baked morning tea and lunch. Phone Pips 'n' Cherries on 07 4663 1184 to make a booking. 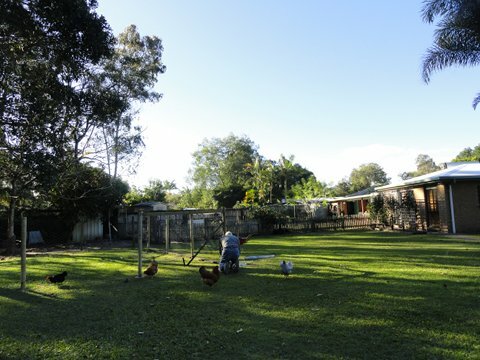 The following week, Permaculture Noosa will be visiting us here to look at the garden. It's going to be a busy month. 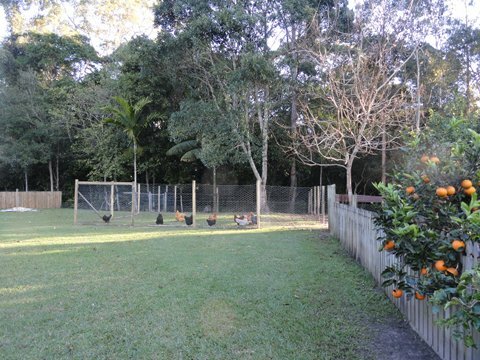 I wrote recently about having ten chooks free range around the backyard and the problems that was causing us. Mainly it was that they like sitting near the back gate, basking in the sun and clucking to each other in low contended tones, while their droppings were smelly and they had burnt off all the grass there. Making the walk out to their coop was unpleasant and slippery in the wet weather and a bare dry mess when the sun was shining. One of the pleasures of being grandparents is that occasionally we have our little people here and we like to have them outside in the fresh air and sunshine - but it needs to be safe, healthy and clean. Over a few morning teas, sitting on the back verandah with the winter sun warming us, Hanno and I devised something new for our feathered friends. We get the backyard and they get a much larger run. Hopefully, it's a win-win situation. 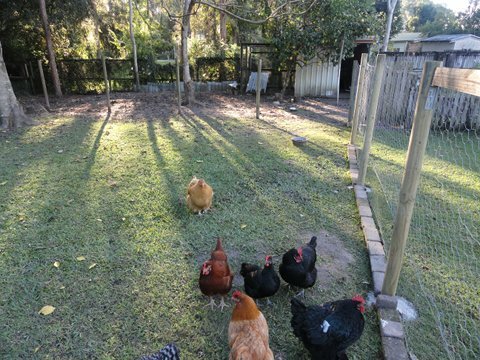 We decided to extend the grounds of chookingham palace so the girls can still wander around, still eat grass, still have both sun and shade, but they'd be confined to their own area. 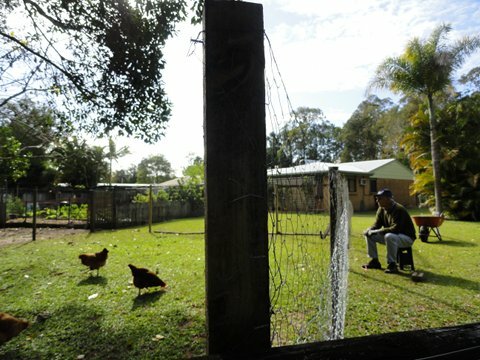 Late afternoon, mid-winter, the worker and the chooks. Construction stopped numerous times because of the rain. The last two photos above were taken yesterday afternoon. The chooks are contained now and soon it will be finished. 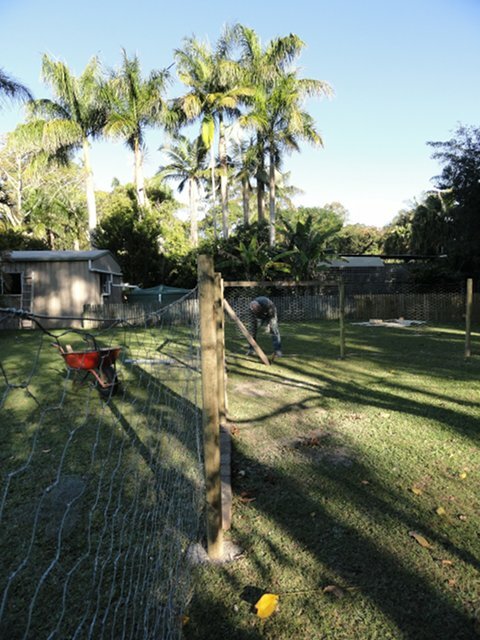 Hanno used as many of the materials that we had here as he could but in the end he had to buy some fence posts and new wire. The old posts and wire were used to patch up the fence along the new section and also along the back on the creekside - which is potentially where foxes and wild cats come from. It needs to be higher. There are three trees in the palace grounds - a native fig, a pecan and a Eureka lemon and they all fruit in their own season. I'm sure all of them will do well with the extra nitrogen the droppings will provide. We'll grow passionfruit along the wire fence as a permanent crop in summer then cut them back and grow sweet peas (my favourite) for a couple of months in Spring. It looks beautiful already - incorporating the recycled and the new - a celebration of production, self reliance and ordinary backyard life. Although it's not quite finished yet, the bulk of the work is complete. 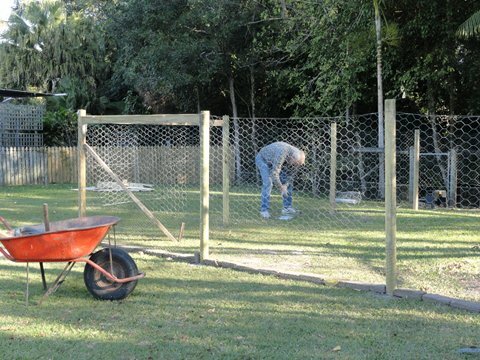 There is some wire to go along the back fence to make it higher and we need to move in a large stone drinking pond. 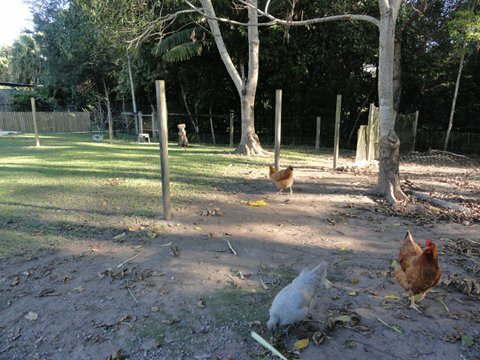 We have a couple of saplings to cut down to provide some climbing frames and day perches for them - chooks LOVE to climb - and Hanno will put up a small sheltered area where they can sit when it's raining. 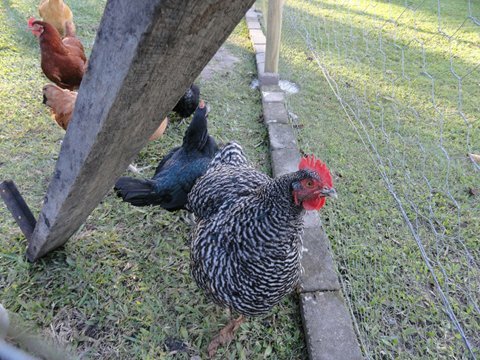 Even though they can easily go into the coop to stay dry, they never do. Chooks are crazy sometimes, but I bet you all know that.